It’s Africa month at P+P and so far we’ve shared with you, the coolest of finds and the prettiest of treasures this beautiful country has to offer. However, we almost forgot about one thing. 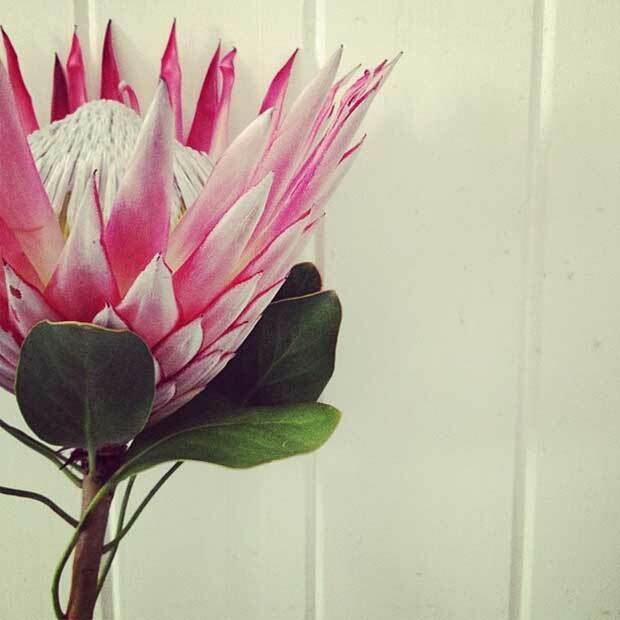 How could we be talking all about Africa and not mention the South African national flower – the gorgeous king Protea? The flower literally seems to bloom like a king’s crown, don’t you think? Colors of this beautiful flower vary from creamy white to deep crimson and apparently Protea also makes for a great cut flower with a vase life of several months! So now you know which flowers to get the next time you want to make a trip to the florist only once in two-three months. Here’s a glimpse into the best of African Protea stencil projects from P+P’s Pinterest page as undertaken by Royal Design Studio. Decor is all about nuances. 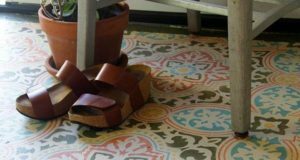 Even the smallest of accents can turn the look of any place from drab to fab. These pillow covers were plain, boring and literally black & white. 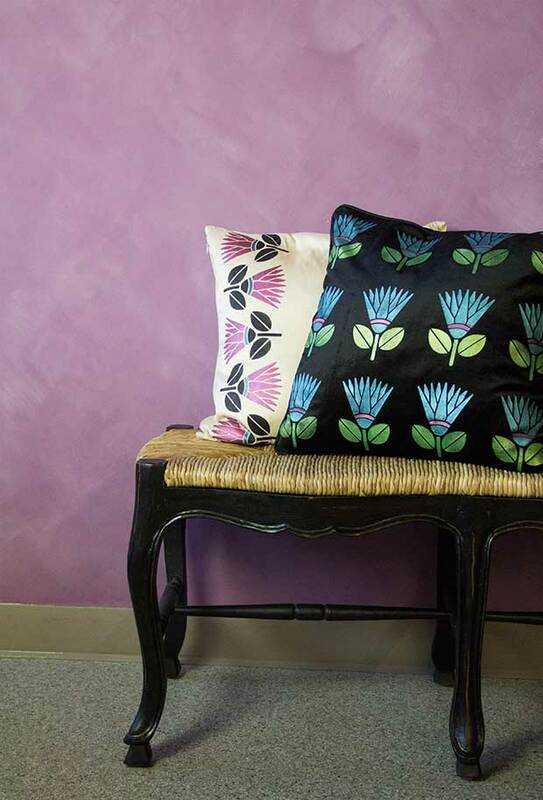 However, Royal Design Studio’s African Protea Flower Furniture Stencil, completely revamped the overall look of this foyer bench, simply by stenciling the pillow covers. 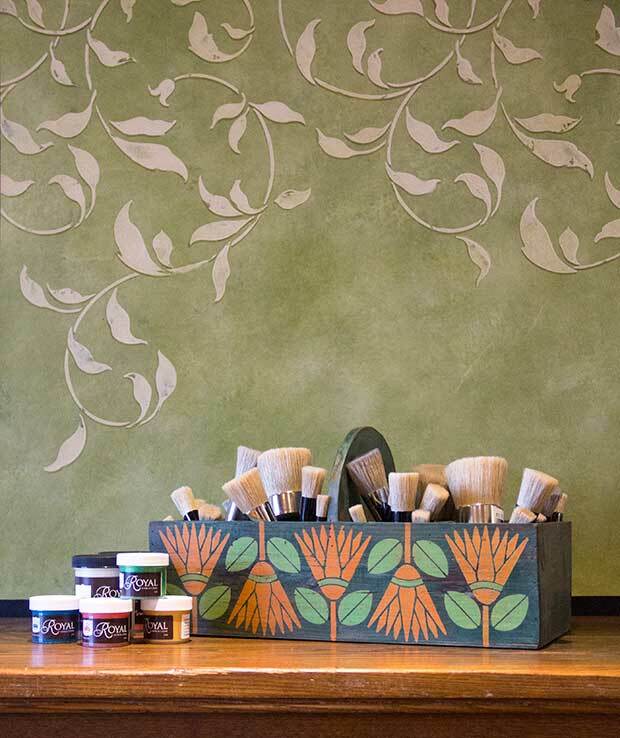 The same stencil was used to face-lift the old stationery box, in the second image below, that was used for storing brushes. Only earlier, it was tucked in behind somewhere owing to its old shabby look and now it doubles as a piece of art on top of the table. 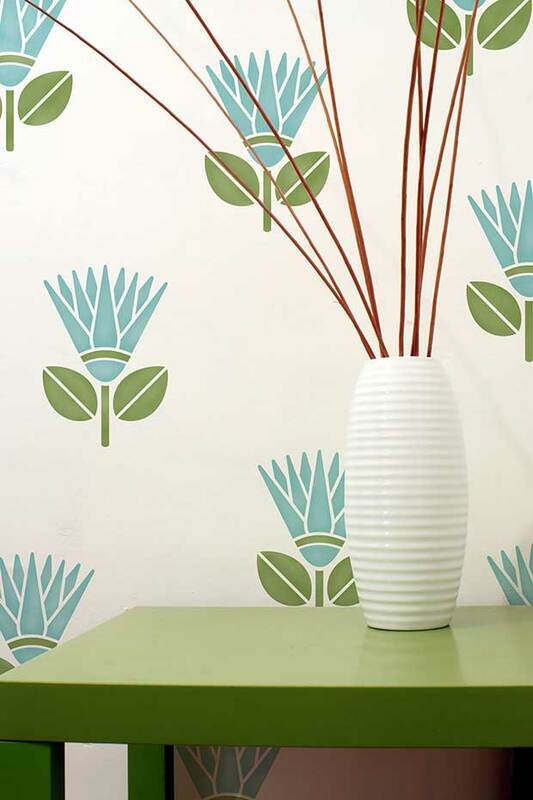 Royal Design Studio recently added two new stencils to its African Protea Collection – African Protea Stencil, Large and African Protea Stencil All-over. 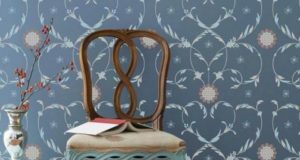 The larger version of the furniture stencil in the first image below, has been used as an allover motif in blue and green chalk paint on a wall, however this stencil can also be used on furniture. 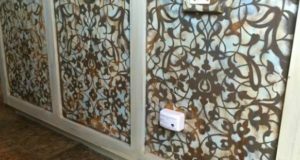 It is a great stencil option when looking to create a tribal-chic look for your projects. 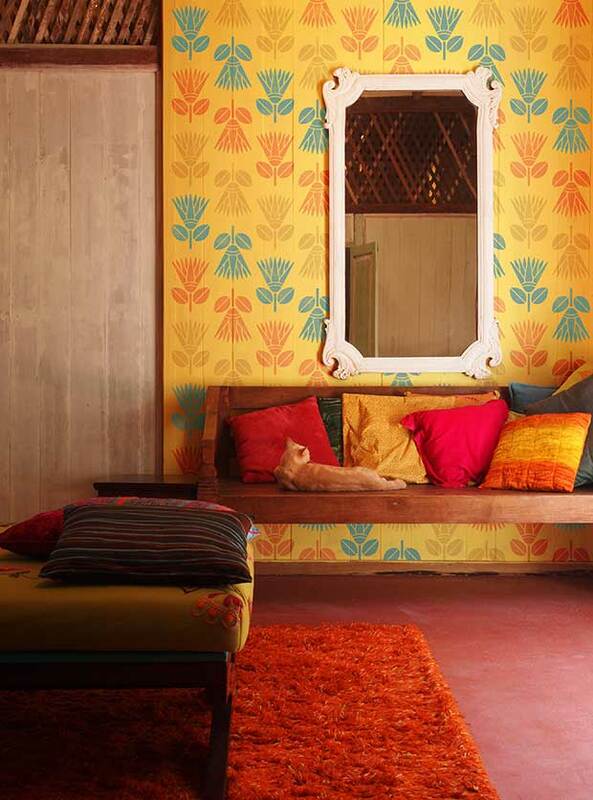 A floral stencil as exotic as its name, the Protea Flower Allover Stencil in the second image below, adds an Afro-Chic vibe to the living space. Simply by using a complimenting color palette combined with contrasting hues, the room seems to have turned into a beautiful tropical room. To celebrate Africa month with us, Royal Design Studio is giving out the African Protea Furniture Stencil for FREE all of this month, with any purchase! If this is the look and style that speaks to you, what are you waiting for? 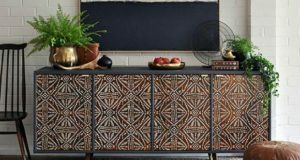 By the way, if you haven’t had a chance to catch up on any of our Africa inspired treasure troves these past few weeks, here’s a brief round up on some of our most popular posts. I was suggested this web site by my cousin. I’m not sure whether this post iswritten by him as no one else know such detailed about my difficulty.You are incredible! Thanks! I really like the design of your site. My friend sent me a link to your website on Twitter. I hope you keep writing great stuff like this. Thanks.